A new 2-disc DVD/CD package (documentary/performance film and live audio disc) featuring a live concert, band interviews, archival footage and more of the legendary New Jersey garage rockers! Rob Adams and sound engineer Kurt Reil. The resulting DVD/CD package is what you now hold in your hands – Rock N’ Raw – a documentary of that show, accompanied by interviews with Myke, Richie, Gar and Mike and archival footage of the band. Extras on the DVD include interviews with such important figures from The Doughboys’ history as John Zacherle (the “Cool Ghoul”) and clips of The Doughboys traversing their home turf of Plainfield, NJ and revisiting landmark rock’n’roll sites in New York City, such as the Café Wha? on MacDougall Street, where they were the house band in the summer of ‘68. 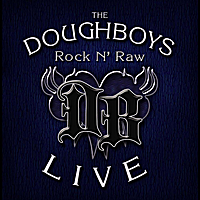 The Doughboys first formed in 1965 and came back together with a bang in 2000. Little Steven Van Zandt has chosen a slew of tunes from their two CDs Act Your Rage and Is It Now? as “coolest songs in the world” on his Sirius/XM Underground Garage show. Their live shows blow audiences away at venues like B.B. King’s in New York City, Maxwell’s in Hoboken and The Stone Pony in Asbury Park, NJ, sharing bills with the likes of The Yardbirds, The Pretenders, Robin Trower, Roberta Flack, Peter Tork and The Electric Prunes. Their music is being aired around the world, from Spain to California to Croatia to Austria. 2010 saw the release of their second album Act Your Rage, described by Sound & Vision Magazine as “a 16-track fireball loaded with flinty, riff-driven, street-wise rockand roll”, by the Star-Ledger as “tight blues-based chord progressions punched up with melodic bass parts, sizzling Keith Richards-ish guitar leads and a drummer who meshes the precision of Ringo Starr with the fiery pyrotechnics of Keith Moon” and by Goldmine as “a bluesy garage-rock machine that kills…every song is rock solid and the hooks are sharp.” Their first album – 2007’s “Is It Now?” – likewise impacted a public obviously hungry for high energy, authentic “garage” rock. The four Doughboys are seasoned and well-respected musicians of the first order – lead singer Myke Scavone led 70’s hard rock ensemble Ram Jam (of “Black Betty” fame); drummer Richard X. Heyman (a/k/a “Richie”) is an acclaimed singer/songwriter with seven albums and two EPs to his credit, not to mention session work with Brian Wilson, Mary Weiss (Shangri-Las), Link Wray and Jonathan Richman; guitarist Gar Francis has made a name for himself with three solo albums and two albums under the Plainfield Slim moniker as well as writing and producing for other known acts, and bassist Mike Caruso honed his chops in the studio backing stars like Jimi Hendrix! The Doughboys were one of the most popular of central Jersey’s bands in the ‘60’s. In 1966, they got a recording contract with Bell Records and released two now extremely rare and valuable singles – “Rhoda Mendelbaum” and “Everybody Knows My Name”, as the band played weekly WMCA Good Guys shows all over the tri-state area. OK, “Rhoda Mendelbaum” never chopped the charts in ‘66, but no matter – The Doughboys rock on. Their live show – immortalized in this DVD - is not to be missed, if you want to see and hear how rock’n’roll used to be – and still ought to be – done. The Doughboys are past catering to trends. Their music is pure them.